Trump’s Chicago flop. The Real Deal says that, even as Chicago’s downtown real estate market has flourished, the Trump International Hotel & Tower has proved Chicago retail’s biggest failure. ■ The company behind the massive and controversial Lincoln Yards project is planning its first project on Chicago’s South Side. ■ McDonald’s says it’ll stop lobbying against legislation to raise the minimum wage. 300+ pages. The New York Times says the still-unreleased Mueller report on Russian interference in the 2016 election runs that long—raising new questions about the adequacy of Attorney General Bill Barr’s four-page summary. ■ Twitter’s working on ways to label Trump tweets that—had they been posted by others—it would delete. ‘Please help me. I’ve screwed up.’ The Tribune’s John Kass paraphrases a memo from Cook County State’s Attorney Kim Foxx, under fire for her office’s handling of the Jussie Smollett case—which Trump wants the feds to investigate. ■ The Republican leader of the Illinois House wants the Illinois attorney general to investigate. ‘There’s no dirt on this guy. 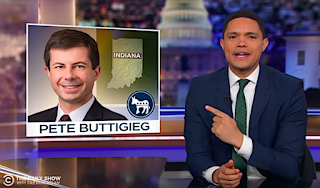 Like, nothing.’ On last night’s Daily Show, a sarcastically disappointed Trevor Noah scrutinized the unlikely rise of presidential candidate and South Bend, Indiana, Mayor Pete Buttigieg (pronounced: “booty-judge”). ■ Another day, another mayor enters the race for the White House. ‘Squabbling over who has taken cheaper shots.’ The Sun-Times’ Rachel Hinton wraps up last night’s final TV debate between mayoral candidates Toni Preckwinkle and Lori Lightfoot. ■ Joining the Trib and Sun-Times, Crain’s is endorsing Lightfoot. ■ Preckwinkle’s campaign is back to advertising on TV. ■ Among the things suburban voters get to decide Tuesday: Should an 18-year-old high school senior become mayor? ■ Don’t vote stupid: Check the Chicago Public Square voter guide. Stranded. Budget airline Wow Air has suddenly ceased its operations, leaving passengers outta luck. ■ The Daily Beast: Months after President Trump’s election, an aviation company run by his ally Jerry Falwell’s evangelical Liberty University landed a nice deal with the Pentagon. Wanna use your Illinois driver’s license to get on a plane? Get ready to pay. The thing now in your wallet or purse won’t pass muster at airports as of late next year, and if you want to use a license (and not a passport) to fly, Illinois Secretary of State Jesse White—whose office dragged its feet for years on new federal security rules—says you’ll have to visit his office … and bring cash. ■ Illinois’ delays in processing food-stamp applications could cost it millions in federal penalties. Facebook’s new headache. The U.S. Housing and Urban Development Department says Facebook’s ad-targeting system enabled housing discrimination. ■ Vice Media has agreed to a $1.875 million deal to settle charges it paid men more than women. Restaurant reverence. This year’s James Beard Award nominees include 16 from Chicago. ■ New at the Museum of Science and Industry: Wearable technology, including jetpacks and touchscreen tattoos. 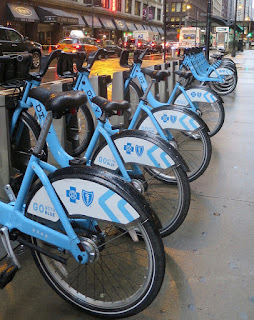 Has this edition of Chicago Public Square pleased you? Thank readers whose support makes it possible, and please consider joining them for a few pennies a day.